Motor oil is very important for getting the best out of your car's engine. The correct viscosity is important as well, so, if your automaker recommends a 5W20 oil for the engine, then that's exactly what you should get. Asides from the oil's viscosity rating, you should keep other factors in mind as well, such as whether it's conventional mineral oil or whether it's synthetic, or comes with additives. In this 5W-20 oils review, you'll get a list of the top offers in the market, plus a buying guide that helps you make sense of it all so that you can make an informed and correct decision. 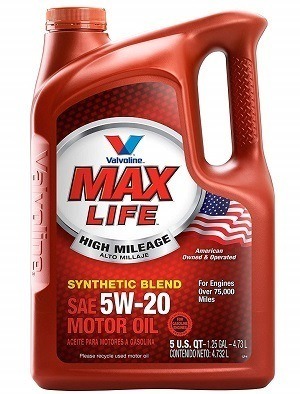 Valvoline's high-mileage 5W-20 oil with MaxLife technology comes designed specifically for gasoline engines that have passed the 75,000-mile point on their odometers. It's a synthetic blend oil with extra additives to make it perfect for high-mileage engines. These additives include seal conditioners to rejuvenate the engine's seals and anti-wear agents to cut down on engine wear. Further additives include detergents and anti-oxidants. This offer is for the 5-quart container but you can also get a six-pack of 1-quart bottles or a 3-pack of 5-quarts. This single bottle 5-quart offer, however, remains cheaper than all these combo packs. Of course, this high-mileage 5W-20 oil only makes sense if your car's engine has passed the mark, else you can find more affordable motor oils without all the extra additives. 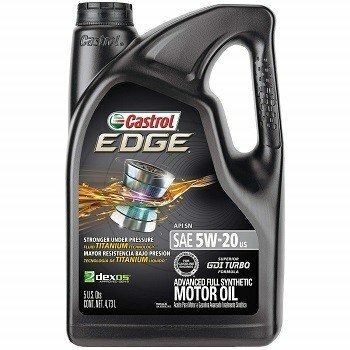 If you are searching for the best 5W20 full synthetic oil for your car's engine, then this offer from Castrol will definitely make your day. Featuring an advanced and fully synthetic formula, it produces the exact level of lubrication to cut metal to metal contact in the engine at different speeds and temperatures. This feature is further backed by Castrol's Fluid Titanium technology, which provides a high level of strength to protect the engine under extreme pressures. It costs a little more than synthetic blend and mineral oils, but if you want an advanced and premium quality oil for your car, then you should check this one out. Mobil is a well known high-quality brand when it comes to automotive oils and this Mobile 1 oil is proof of that. It's a full synthetic oil that's used by many high-performance vehicles. The formula is specially designed to keep any engine running just like new, while cleaning it, offering wear protection, and improving overall performance and fuel economy. It costs more than the other brands however, but Mobile is a brand you can rely on any time, so the extra price that you'll pay for this best 5W-20 oil is definitely worth it. Another issue is that it's designed for newer engines with less than 75,000 miles on their odometers, so you may want to find another oil if you've got an older engine. This Castrol Edge 03086 is nearly identical to the Castrol Edge 03083 above, except that this one is the Extended performance version. With its extended performance, Castrol guarantees up to 20,000 miles between oil drains. 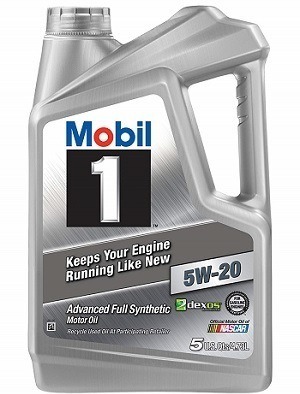 This is the major feature of this motor oil, so it does not feature much else, such as additives. It is made using a full synthetic oil formula and includes Castrol's Fluid Titanium technology, which provides plenty of strength even under extreme pressures. 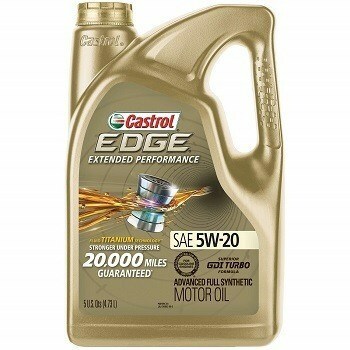 This offer is for a 5-quart container of 5W-20 full synthetic oil, but Castrol also offers it in a pack of three. 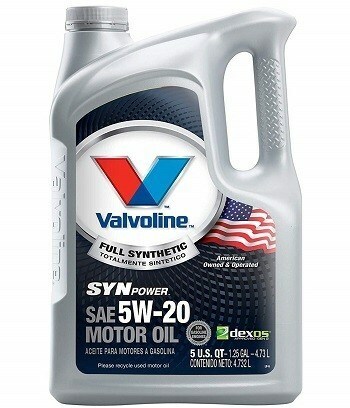 Valvoline's full synthetic oil is another top-rated 5W20 oil that's great for most vehicles, including those with high-performance engines. It uses a unique formula to offer lots of features, such as its superior sludge and deposit protection using quality detergents and dispersants. This oil also offers high-temperature protection under severe driving situations, as well as cold-temperature protection from faster oil flow at start-up. You should note, however, that this oil is different from Valvoline's MaxLife offer, and that although it costs a bit more, it's also designed to lubricate the best performing engines. Different oil formulations offer different benefits for different types of vehicles. This Royal Purple offer is specifically designed for modified engines. It offers maximum wear protection, helps to maximize torque and horsepower, and offers the best protection for all kinds of modified and racing engines. In other words, this is an engine oil for the streets, so it's not recommended for use in cars that are still under warranty. It also responds to higher pressures simply with more viscosity. The formula includes the Synerlec additive technology, plus zinc and phosphorus anti-wear additives to make it one of the best 5W20 oils for high-performance engines. If you love to push your ride to the max, then take a closer look at this offer. 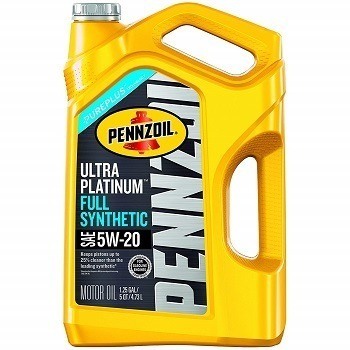 The Pennzoil Ultra Platinum oil is made using Pennzoil's PurePlus technology, which uses natural gas to create a high-quality full synthetic oil with fewer impurities than those made from crude. This process creates a motor oil that's unique in providing a high level of protection and lubrication for performance-car engines. It offers excellent viscosity levels at both high and sub-zero temperatures. It also helps to support cleaner pistons and protect against horsepower loss, which often results from engine wear and deposit formation. 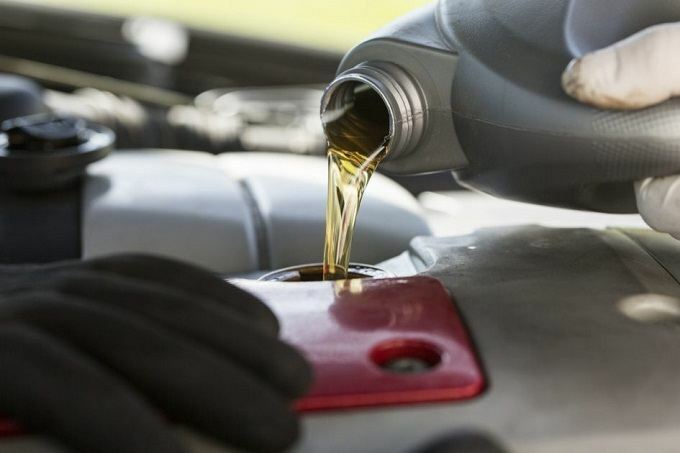 You should note, however, that this oil lacks the proper additives to make it ideal for high-mileage engines but Pennzoil offers a high-mileage version of this oil. 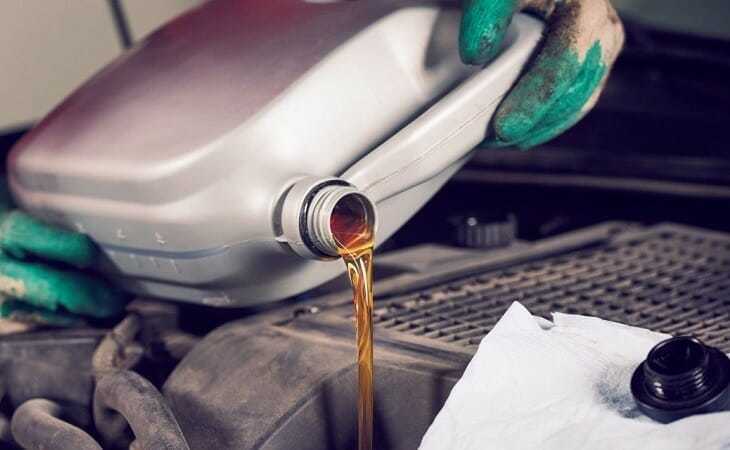 Before getting 5W20 oil for your vehicle, you should pay attention to a few important factors that make up the overall quality of the oil that you get. This means that all motor oils are not the same, even when they've got the same viscosity. Following are these few important considerations that you should make before settling on a particular brand. Different engines have different power and oil viscosity ratings that the manufacturer recommends. If you use oil that's too thick for a small engine, it might slow it down, cut its power output, or make it fuel inefficient. On the other hand, if you use a too-thin oil for a heavy-duty engine, you'll get lubrication problems. As you can see, every vehicle has its recommended viscosity, so before you buy a 5W20 oil, check your car first to make sure that a 5W-20 grade is actually recommended for the engine. The other major difference between engine oils is the type of oil, which refers here to its composition. The major types are the mineral and the synthetic oils, and following is a closer look. Mineral Oil. This is automotive engine oil that's derived from crude oil. It can undergo different levels of refinement to get rid of unwanted compounds, producing thereby, standard and premium oils of different qualities and prices. Full Synthetic Oil. Here, the oil gets developed in a laboratory to meet certain standards like high lubricity at both low and high temperatures. These types of oils are usually recommended for premium and high-performance car engines. Their drawback is that they are expensive and so, most people tend to shy away from them. They, however, last for longer miles than conventional oils, often up to twice as long, before needing a change. Synthetic Blend Oil. This type of oil combines mineral oils with synthetic oils to produce a blend that offers better protection for heavier loads at higher temperatures, and at a lower cost. Synthetic blend oils are popular with pickup and truck engines who benefit from the synthetic oil features while maintaining a much cheaper price than full synthetics. High-Mileage Oil. Cars are lasting longer these days, with most vehicles having crossed 75,000 miles on their odometers. For such vehicles, you can use these high-mileage oils, which come with additives designed for older vehicles, such as seal maintenance and wear protection. An additive is any extra compound that gets added to automotive oil to give it certain desired features. The most common additives and their features include detergents that help keep the engine clean, anti-wear agents, viscosity improvers, dispersants that keep particles from forming sludges, and lots more. You should only go for oil with an additive that makes sense for your car's engine. Else, additives are just a secondary feature of motor oils and may even create a negative effect in an otherwise healthy engine. We've reached the end of this 5W20 oils review and you've seen the different offers out there in the market. From high-performance oils designed for performance cars to high-mileage oils for high-mileage engines. You've also seen oils designed for top power and with impressive viscosities at the widest temperature ranges. To make the right choice therefore, you should consider your vehicle and its special needs, then choose an oil that best meets those needs.